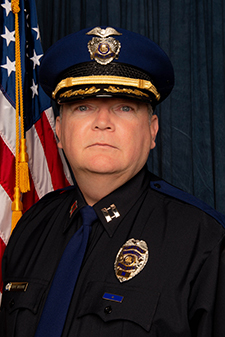 Captain Ron Sellers is the current Commander of the South Precinct Division of the Field Operations Bureau, and has served the Citizens of Birmingham for 24 years. He started the Birmingham Police Academy in November 1994 and after graduation he was assigned to North Precinct Patrol. He started his career as a Utility Officer at North Precinct and was later assigned as the Beat Officer for the largest Public Housing Community in Birmingham, Metropolitan Gardens. He was also an assigned Field Training Officer and worked on the Precincts’ Drug Task Force while assigned to North Precinct. In 1999 Captain Sellers was transferred to the Vice/Narcotics Unit where he was assigned to an Investigative Team and also served as a member of the units Entry Team. While assigned to the Vice / Narcotics Unit he was qualified in special weapons, diversionary devices and dynamic entries. He was later assigned to the Federal Bureau of Investigations “Innocent Images” Task Force on Child Exploitation, where he received a National Security clearance through the F.B.I. During this time he conducted covert operations that resulted in exploitation arrests of suspects locally, across the State and Nationally. Captain Sellers finished his time in Vice / Narcotics assigned to the D.E.A. HIDTA Drug Task Force, some of the cases worked took him to Texas, Mississippi, Georgia and across the State of Alabama. Captain Sellers was promoted to the rank of Sergeant in 2007 and was assigned to the South Precinct Patrol Division and supervised on all three shift to include the H.I.C.O.P.P. Units assigned to the Public Housing Communities. In 2008 He was transferred to the Detective Division and took over the Project I.C.E. Unit which investigates gun crimes that have a Federal nexus. During this time Captain Sellers wrote a proposal for the Southeast’s first specialty misdemeanor gun court. This court is better known as “Gun Court”, and provides enhanced oversight of those convicted of first time gun offences, and is still operational today. In 2011 Captain Sellers was promoted to the rank of Lieutenant and was transferred back to the Vice / Narcotics Unit where he oversaw the Interdiction, Vice, Technical Surveillance and Patrol Case Units along with the Narcotics K-9 Officers. During this time the Unit was responsible for the closure of several business that were deemed “Venues of Violence” by the City Council. In November 2015 Captain Sellers was promoted to the rank of Captain and took over Command of the Vice / Narcotics Unit where he oversaw changes to the training and weapons platform. In April 2016 he took over Command of the South Precinct Patrol Division. As the Commander of South Precinct, Captain Sellers has worked to make the South Precinct Command staff as accessible as possible. He has started the South Precinct Facebook page to engage social media as well as a new email address the reaches all levels of command staff at South Precinct including the Crime Prevention Officer – southprecinct@birminghamal.gov. Captain Sellers has also worked closely with REV Birmingham on different issues. Recently with the assistance of the 5-Points South Business Alliance and the 5-Points South Neighborhood Association, South Precinct was able to close a late night club that was the scene of repeated disturbances and violence. Crime reduction and Professional Service is always the priority at South Precinct. You are welcome to stop by the Precinct and talk with Captain Sellers in person or he can be reached at the contact information below.